Children’s FREE Hospital “Busy” Bags!! 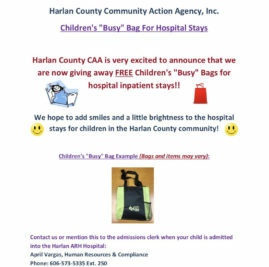 Harlan County CAA is very excited to announce that we are now giving away FREE Children’s “Busy” Bags for hospital inpatient stays!! DONATIONS FOR THE HOMELESS, AWESOME JOB!! Have you or your spouse been laid off recently? Harlan County Community Action Agency, Inc. (HCCAA), is a private non-profit 501(C)(3) corporation that began on January 21, 1969, for the purpose of eliminating poverty in Harlan County, Kentucky. The overall purpose of HCCAA is to turn hope into reality and make our low-income individuals more self-sufficient. HCCAA gives a voice to the less fortunate and provides services whether in-house or by our community partners. HCCAA provides a multitude of various programs to assist low-income individuals and families to achieve and sustain self-sufficiency and a sense of well-being in the community. HCCAA programs help to provide better everyday living for persons in the service area. Our agency is needed for transportation, utility and security deposits assistance, medicine, child care, youth services, college tuition, weatherization assistance, homeless assistance, etc.